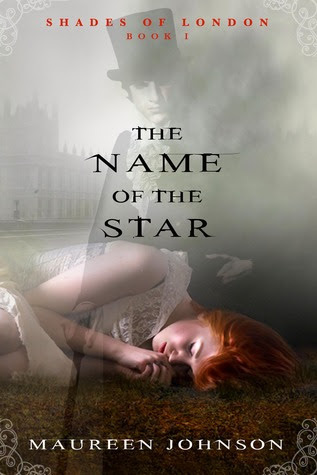 The Name of the Star [Book Review] – my books. my life. Rory, a teenager from Louisiana, gets to spend her last year of high school at a boarding school in London. And she is psyched. But her move to London coincides with the start of a string of murders – all copycats of Jack the Ripper. Her year begins to look much different when London is thrown into terror and the murders are occurring within blocks of the school. When Rory, and only Rory, spots a man near the scene of the crime, the police aren’t the only ones who are interested. Rory may be the next victim, unless she can solve the mystery that has sprung up around her. This book came around right when I needed it. I was (am) in quite the reading drought. Nothing was keeping my attention. Enter The Name of the Star. The Name of the Star has England, a boarding school, and Jack the Ripper. Tell me that doesn’t sound like a win. I was already a big fan of Maureen Johnson’s, but she continues to impress me. Now, partway through this books I thought, “huh, I didn’t know there was a paranormal aspect to this story.” That has happened to me before (since everything seems to have a paranormal element these days) and it takes a moment to shift gears. But here, despite my failure to realize it woud be there, the paranormality just flowed right with the story. Ultimately, I loved the characters, I was sucked into the mystery, and I am very excited that there will be more in this Shades of London series (this one stands well on its own though so don’t let a series deter you). If you haven’t already, I highly recommend picking this one up for an enjoyable weekend read. I really want to read this one, and am not really bothered by the fact that although I didn’t expect it to have paranormal aspects, it does. It sounds like a book I really need right now, as I am in kind of a reading drought. I haven’t been able to read much lately, but perhaps this is just the book I need 🙂 Great review today! I am glad that you enjoyed this one and are looking forward to the next book in the series! So happy to hear you enjoyed this one! I didn’t realize it was a series either until after I finished, and I totally agree it can stand on its own. Thanks for the shoutout! I tried to read a Maureen Johnson book a couple years ago, but it was so so bad. I never not finish a book but had to let that one go. BUT Jack the Ripper fascinates me, and I’ve heard good things about this one – you included – so…I might have to give her another go. I’m curious which book you tried to read. My first Maureen Johnson was not a favorite – Suite Scarlett. But then I read 13 Little Blue Envelopes and became a believer. I own this, but have yet to read it. Lots of people seem to have enjoyed it, and I like the thought of reading a book that so many blogging friends have loved. Pingback: The Madness Underneath [Mini-Review] | my books. my life.